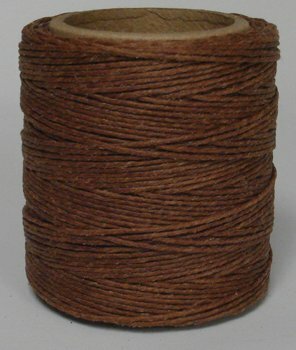 Maine Thread - .040" Goldbrown Waxed Polycord. 210 feet each. Includes 2 spools. Maine Thread - This is a 100% Filament Polyester, dyed, textured, twisted (right twist), waxed, and wound. .040" waxed thread has a diameter of 1 mm or .040" (40/1000 of an inch), comparable to the thickness of a standard paperclip. .040" has a breaking point of 49 LBS. 210 feet on each spool. This extremely durable waxed polycord is proudly made in the USA. Note: Image shown is .040". Colors may vary due to dye lots and computer monitor settings. Size: .040" (4ply) medium weight, 210 feet per 2.5" spool. View More In Basket Making. If you have any questions about this product by Maine Thread, contact us by completing and submitting the form below. If you are looking for a specif part number, please include it with your message.